Yesterday, David and I wanted to go out to celebrate. Something fancy. Good food, great wine, candlelight. That kind of thing. But yesterday was Sunday. And it transpires that Sunday is a day of rest for all the restaurants of a certain calibre in the great city of Berlin. Some of them even stay closed on Monday too!!! So, we have postponed our celebratory dinner to Tuesday night. So, what did we do last night instead? We caught the Underground from Mitte, where we are staying, to Kreuzberg (where we stayed on the first leg of our holiday), bought some beer, got in line and waited. For an hour and a half. Out in the cold, with several other crazies. What were we waiting for? 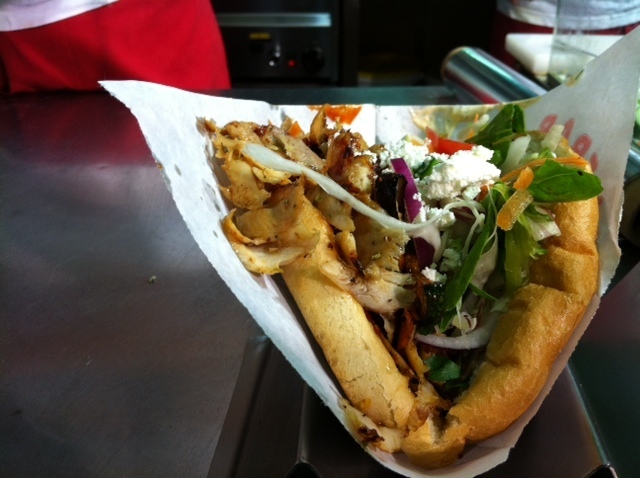 Mustafa’s (apparently, and well-deservedly, renowned) Döner kebab. Whatever else you might be able to say about us, you cannot call us food snobs. So yes, we waited. About 45 minutes into waiting, they ran out of meat and had to put on some fresh chicken. Which, of course, meant we’d have to wait even longer, to make sure it was properly cooked. 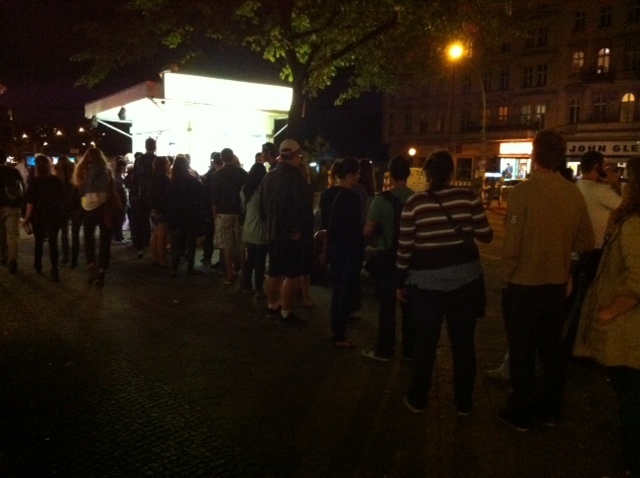 The couple behind us threw in the towel at that point, opting for the vegetarian Döner (for which there was no wait). But we dug in our heels and stuck it out. Was it worth the wait? Waiting in line. For a long time. For what????? 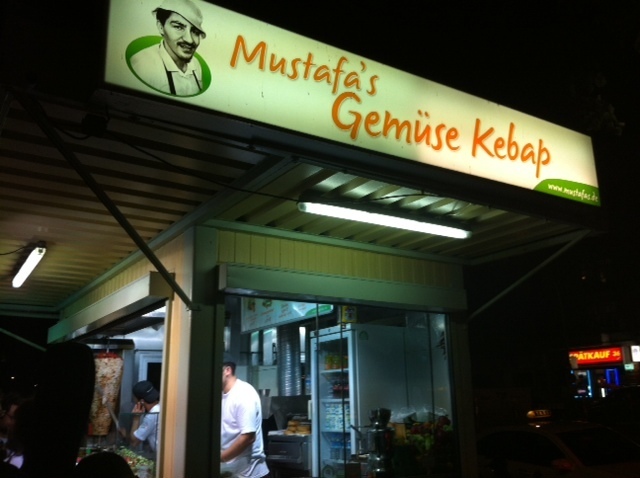 Mustafa’s Gemüse Kebap! I don’t even know what that means exactly!!! Nor do I actually care, coz it just tastes so good!! Well, they use only the freshest ingredients and roast their own veggies on site (potatoes, eggplant, capsicum, onion), seasoning it all with oregano and fresh mint. These guys work like a well oiled machine. They slather one side of the bun with a garlicky sauce and the other with a slightly spicy chilli sauce. And the meat. Oh my goodness, the meat! Tender, succulent, tasty! And I think the chicken is just about ready. I want my Döner kebab and I want it NOW!!! They add some freshly chopped tomato, carrot, parsley and lettuce, and finish it all off by crumbling some feta cheese on top of the finished product. Was it worth waiting for? Abso-freaking-lutely!!! Wow! BEST anniversary kebab ever!!!! Well, thank you very much. It really makes my day to hear this.